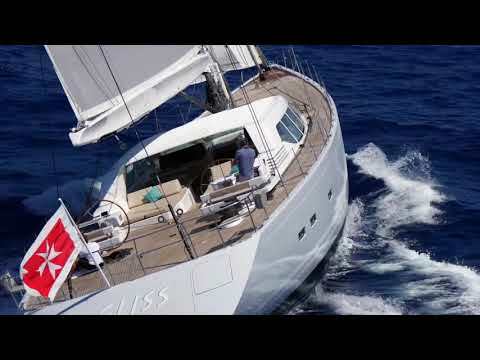 Royal Huisman has released a video showing 32 metre sailing yacht Gliss fresh from her major winter refit last year. 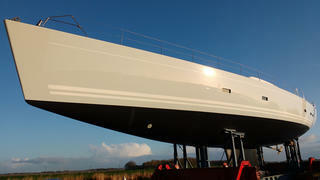 The yacht, which was relaunched in Vollenhove last year, is seen being put through her paces under sail. Formerly sporting a bright turquoise hull, Gliss was refinished in a ‘whisper grey’ shade during the seven-month works programme, which was completed on time and on budget. Gliss underwent sea trials before being returned to her owner. First launched in 2006, Gliss is an all-aluminium sailing yacht with naval architecture by Philippe Briand, who also provided the exterior styling. Her interior décor, courtesy of the late Pieter Beeldsnijder, remains largely unchanged by the recent refit, and her vital statistics include a 3.9 metre draught and a maximum beam of 7.45 metres. Accommodation is for seven guests split between four staterooms. These include an owner’s cabin, a double room, a twin and a single. Meanwhile, the crew quarters allows for a staff of up to four people. Auxiliary power comes from a single Scania D12-65M engine, which provides a top speed of 13.5 knots, while the total fuel capacity of 8,500 litres allows for a maximum cruising range of 2,000 nautical miles at 10 knots.